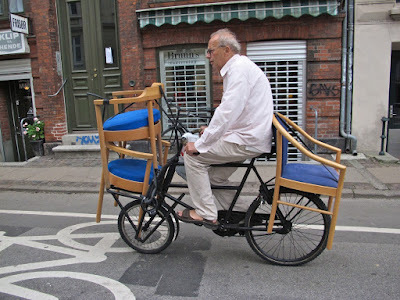 I came across this photo at ClassicCopenhagen (Thanks Sandra!). I find this image inspiring on so many levels, but manly that it illustrates that all sorts of things can be carried on a bike...no matter your age. To see a few of the things that I've carried on a bike, click here. Wow! That brings back some memories. I lived in a suburb of Copnehagen (Holte) back in the early seventies. Copenhagen was actually more car-centric in those days but the bicycle was perfectly accepted as a mode of transportation. We would regularly ride our bikes to the train station and then take the train into the city centre. My favourite place in Copenhagen (besides Tivoli Gardens) was the "Stroget" a pedestrian only street in the city centre. It was the first time I enjoyed a car free section in a city. Great pic.....Happy New Year to all! Happy New Year to you guys...I hope the weather in Canada and Germany is holding out...been pretty mild here so far.